Bow Hunters Supply Store | Archery Supplies, Bowhunting Supplies – Get Nocked and Loaded! You are all invited out for our 3 Spot Vegas Target Indoor Shoot this Thursday, March 21st, 2019. Practice starts at 6 p.m. and the shoot will begin at 7 p.m.
You are all invited out for our 3 Spot Vegas Target Indoor Shoot this Thursday, April 18th, 2019. 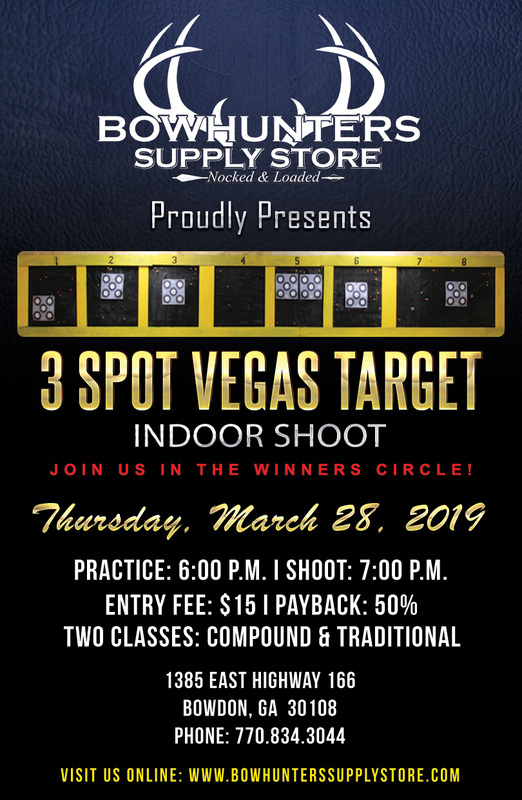 Practice starts at 6 p.m. and the shoot will begin at 7 p.m.
You are all invited out for our 3 Spot Vegas Target Indoor Shoot this Thursday, March 28th, 2019. 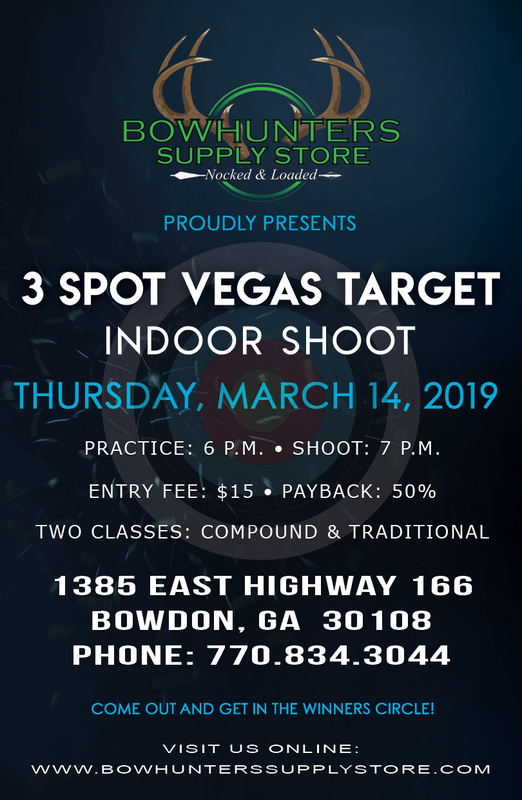 Practice starts at 6 p.m. and the shoot will begin at 7 p.m.
You are all invited out for our 3 Spot Vegas Target Indoor Shoot this Thursday, March 14th, 2019. Practice starts at 6 p.m. and the shoot will begin at 7 p.m.
Aaron Seabolt gives you the scoop on the 2019 Obsession HB33, now available at Bowhunters Supply Store. 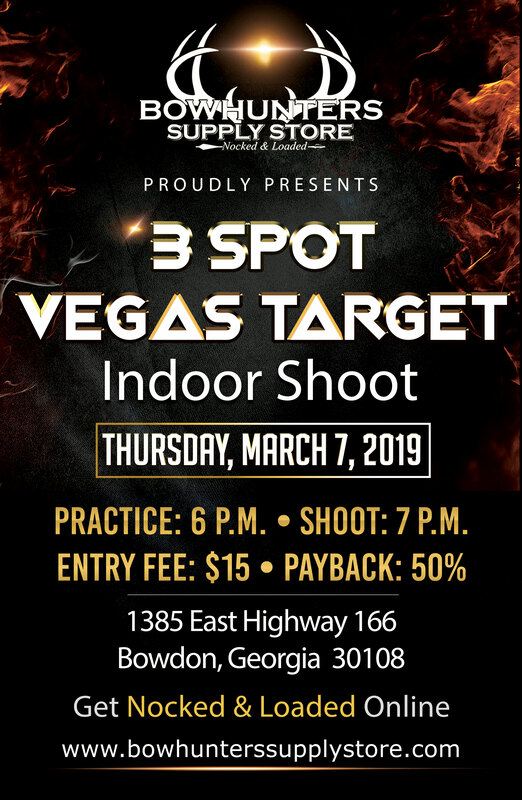 You are all invited out for our 3 Spot Vegas Target Indoor Shoot on Thursday, March 7th, 2019. Practice starts at 6 p.m. and the shoot will begin at 7 p.m.
You are all invited out for our 3 Spot Vegas Target Indoor Shoot this Thursday, February 21st, 2019. Practice starts at 6 p.m. and the shoot will begin at 7 p.m.
Come join us for our 3 Spot Vegas Target Indoor Shoot this Thursday, February 14th, 2019. Practice starts at 6 p.m. and the shoot will begin at 7 p.m. There will be a $15 entry fee with a 50% payback. 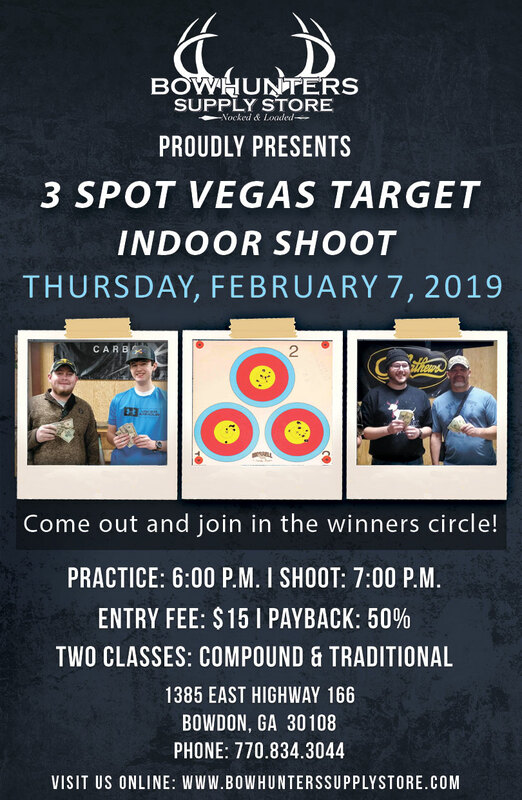 You are all invited out for our 3 Spot Vegas Target Indoor Shoot, Thursday, February 7th, 2019. 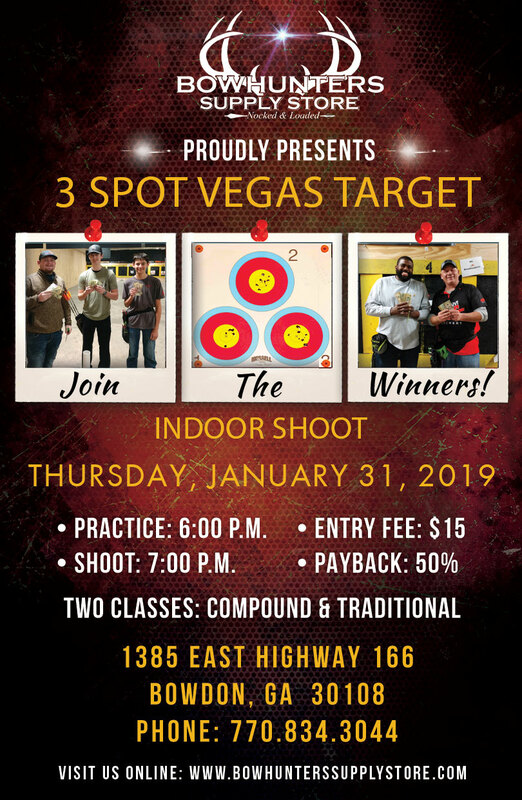 Practice starts at 6 p.m. and the shoot will begin at 7 p.m.
You are all invited out for our 3 Spot Vegas Target Indoor Shoot, Thursday, January 31st, 2019. Practice starts at 6 p.m. and the shoot will begin at 7 p.m.